Smith's Rosebud Salve is a multipurpose balm that moisturizes lips, hands, basically any dry skin and can be used to calm skin irritations. It apparently can also take the sting out of burns and treat diaper rash too. 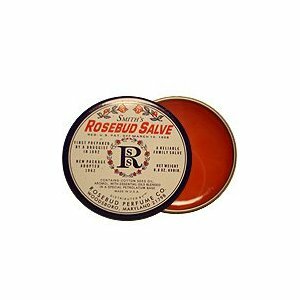 Rosebud Salve was made in the U.S.A by a druggist in 1892. It doesn't contain any harsh chemicals, so I would recommend it even for a baby's sensitive skin. There's many user reviews out there on this balm and I can't find any negative comments about it. A blend of Essential Oils (Aromol) and cotton seed oil in a petrolatum base. I like that fact that is doesn't contain a huge list of chemicals in its ingredients. It is available in a variety of flavors including minted, strawberry and brambleberry. If you are interested in Smith's Rosebud Salve it retails for $7 on Amazon but if you shop around you can get it for around $5. Which for the amount of uses it has is a good price. 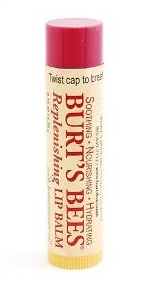 Burt's Bees Lip Balm as it also doesn't contain any harsh chemicals. You are currently browsing the archives for the Lip Balms category.